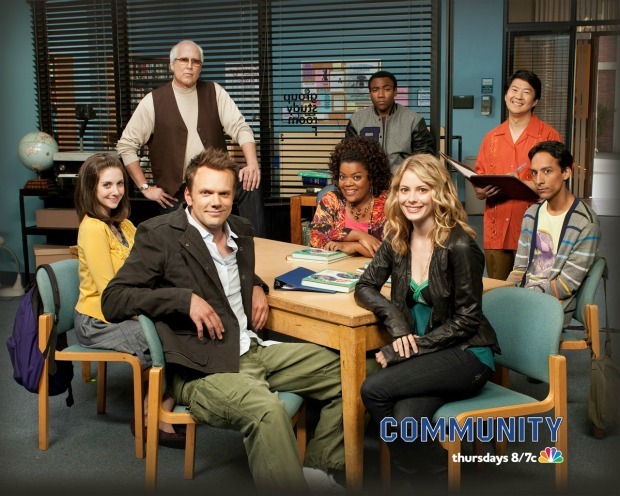 The wait is over for Community fans: NBC has announced that the fourth season of the hit comedy series will premiere Thursday, February 7 at 8 p.m.
Community will take the time slot of 30 Rock which is currently in its final season. Season four was set to begin October 19, but two weeks before that date, NBC announced it was postponing Community (along with Whitney, which will start its second season Wednesday, November 14) to focus on promoting its other shows. NBC also announced premiere dates for the following shows: Smash (February 5); Revolution (March 25); The Voice (March 25); The Biggest Loser (January 6); The Celebrity Apprentice (March 3); and Betty White's Off Their Rockers (January 8). The network aslo announced changes for two of its other sitcoms: Parks and Recreation will move up an hour on Thursdays to 8:30 p.m., starting January 17, while the show that currently occupies that time slot, Up All Night, will go on hiatus as it makes the transition from a single-camera comedy into a multi-camera comedy that's shot in front of a live audience.